I did some basic double resonant tests at 50V.So far everythings seems to work.The OCD is doing it's job,I don't know if it activates at the right currents-should check it with the scope.It has a small problem though,since at the lowest potentiometer range,when the blue 7-segment display shows 0.00,it stops activating. The static load test was made,the water in a can heats up.I calculated a maximum of 6 half cycles to charge the MMC to about 1920V,where the peak current is around 200A.The MMC is weak yet,just two PHE450RD6220J capacitors in series. Is it rectified mains ready? 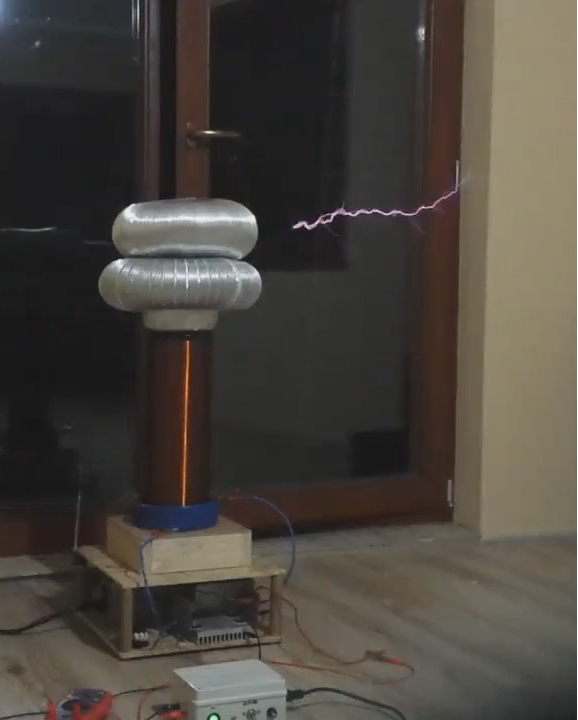 Great that you have it working as a DRSSTC now, there is only one concern from me, your very high coupling from its SSTC time is way too much for a DRSSTC and you will see flash-over from primary to secondary and most likely ruin your secondary coil if you run that at full voltage. Use the proposed 0.13-0.15 coupling from JavaTC, any experiments with higher coupling than that will have to take extraordinary care of insulation between the coils to prevent flashovers. Having the primary tuned 10% below the secondary is properly even to maximum spark loading, so that is also why you see a performance increase from added topload, you pull the secondary coil closer to the primary resonance. The switching spikes are perfectly normal for low voltage testing, it is due to the output capacitance Coess of the IGBT, the voltage spike caused by this capacitance is the same all over the input voltage range, so once you have full dc bus voltage across C-E the spikes will look much smaller as the waveform amplitude increases but the spikes voltage remains the same. The same goes for the curvy dipping "square" wave, it is a cause of low voltage testing. Can I try the static load test on rectified mains and measure the inverter output with a 1:10 probe? There is some very important things to know about oscilloscopes and doing measurements on a inverter output without a differential probe. Watch this to avoid blowing up your scope. What about the static load test?Since the first snow arrived today,I'd like to make tests inside,without the counterpoise. Is there any RMS current formula for a DRSSTC,just to make sure that it will not blow any fuses?! Thank you for the help!I couldn't calculate the RMS current as I wanted,however that's pretty useless since while it runs as SSTC,the duty cycle isn't constant.The only reason was to know if a simple 2A fuse can handle this load,because any higher current fuse will break slower,than the mains automatic fuse if something shorts and that would be a big shame on a presentation.So I just cross my fingers and beleive in the power of silicon! I will countinue testing in dual resonant mode,but I don't want to ruin the current driver,since I have to bring it to many places these days.If this "season" ends well,I will definitely look around for some bricks/minibricks and newer drivers,like the UD2.X or UD3.I'm already digging into freewheeling and complicated stuff like that. Until then I'm going to return to the old coil(which also had a better 1:4 diameter to height ratio for dual resonant mode)with a IRG4PC50W full bridge. Mads,you were right about the too high coupling,racing sparks appeared while I tested on rectified mains.Due to this I made a flat primary which now has 0.17 coupling at 159kHz(secondary at ~166kHz).It works,but I'm afraid of turning the OCD over 2.3V(1:1000 CT, 10ohm burden resistor, so 230A of peak primary current).Should I go higher with my HGTG30N60A4Ds or maybe a static load test would be helpful?Can I measure the primary current with my oscilloscope from the OCD CTs while operating? You are still operating within the Icm rating of the IGBT, that is rare for a DRSSTC. There is no doubt that your bridge will last a long time when you nurse it like that. I would say there is still some headroom for longer sparks there. But I would also do some calculations on it as the tipping point for a TO-247 IGBT can be a few 10s Ampere or a bit longer on-time, that junction just has so little thermal mass that its as easy as with bricks. Bei aware that the current trip point at the driver is not the maximum current. The driver makes a full swing to zero before it shut down the bridge. When I set the current on my big coil to 750A there are conditions where it reaches 1200A peaks. In operation the biggest peak current is not on high interrupter frequencies it is on the single shots. It is a good practice to confirm the current you set with a scope. The UD3 spits out the peak current, which is very handy. I turned the OCD up to 300A,still no decent sparks.I think either JavaTC fooled me,or I tuned badly.I was thinking about the capabilities of a not paralleled TO-247 full bridge at the beginning with this medium sized coil. Can I measure the primary current with my oscilloscope on the OCD CTs?Will the probe put unwanted noise into the driver? The UD3 spits out the peak current, which is very handy. I'm going to build the UD3,but without a powerful inverter a QCW coil is the best I can make for now. Turned out JavaTC was almost accurate(12kHz primary difference).Measured one IGBT gate and the frequency was 147kHz,which explains why the coil runs better with the second topload on.The primary current waveform is still ugly as well as the inverter output(which I can only measure at low voltages with my 1:10 probes).I thought the sparks lenght increases continously with the current,but as I said,cranking the OCD to almost 300A still leaves puny output.Is this normal behaviour? What did you change on the coil since the original post? It seems like you are switching on maximum current and not ZCS. Its hard to tell if the current is actually ringing up, as you only show the first part of the ring-up/-down. The smaller the coils get, the more nitpicking they are to tune correctly, to get a good spark output you need to play some more with tuning the primary coil tap point instead of just trying to tune it by changing secondary topload capacitance. Adjusting the OCD does not mean that you have more current flowing, the idea of the OCD is that it should not trip unless you have a hard ground strike, all energy should be transferred to the secondary circuit and result in sparks. If you have little sparks and continuously have OCD trip, its out of tune, the current just circulates the primary circuit and too little of it is transferred. The spikes on the current waveform, is that really from a CT with a burden resistor on it? Seems very noise. That's exactly what I wanted to know,thanks for it! I only changed the primary coil to a flat one for lower coupling.The scope is hooked up to the OCD CT's outputs,which are connected to the driver via the rectifiers and then the burden resistor.Sadly I have no more CTs right now.The primary coil's wire is also insulated,so no tap points. 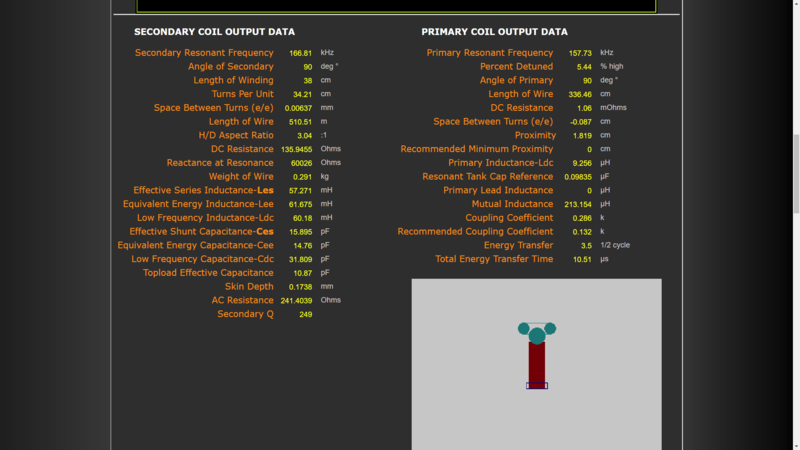 :/ A tunable primary would be nice not for this coil,but for the bigger,with some bricks. You need a tapable primary for DRSSTC, everything else is just out of the question. The golden spot of best performance can be within 10 mm on the primary coil, so fiddling with fine tuning is really a big deal here. I have a lot more issues with the primary current noise.During just a static load test the primary current is really noisy,like I posted the scope shots before,with just a 10 ohm burden across the CT's output and not connected to the driver.I thought my wirewound burden resistor causes a phase shifting by it's inductance,but the signal is the same with a metal oxide resistor.The driver seems to switch at zero voltage,but there's a long delay,which probably makes the IGBTs to switch hard. The large primary current spikes,which forms when the inverter switches are way over the limitations,for example at this picture they are over 10V on the scope,so over 1000A in the primary! I was also thinking about the twisted(paralleled) wires from the inverter output to the primary,which might create a delayed magnetic field(noise),however the problem is the same with simple wires. The MMC is weak,just two PHE450RD6220J capacitors in series,I hope they aren't causing the problem...I found around 10 WIMA FKP-1 capacitors in a local store,I will buy them next time. Sadly I found no similar problems to mine,everybody has almost clear primary current on the web.Taking the whole thing apart and testing everything would be great,but then the coil is ruined again.Pretty frustrating! Its hard to tell if the current is actually ringing up, as you only show the first part of the ring-up/-down. The primary current is ringing up,then down nicely,interestingly,the inverter output voltage too! Do you have something like a 4-6 KOhm power resistor you could try to mount across the inverter output? This is a fix that is used in large coils with glitching driver problems, it could be fun to see if you just have a driver that is not locking on correctly due to residual MMC charge. How did you cut the pipe form for the primary so square and straight?? Also, how have you ensured the wired stay put where they're supposed to be?